Place your Galaxy Mini on your palm of left hand, hold it on the rear panel facing upward with your left finger. Then using tip or fingernail of your finger, open the back cover from the bottom side of the phone in which the speaker locates: insert, grip, then lift it up. Still had some sides on the cover attached? Don't worry, use your fingernail to remove the part that didn't yet opened, make sure all the cover detached and you can easily remove the cover. Whatever you wanna do after opening the rear Casing, whatever you had done after that, if you had finished the job, make sure before you using the Samsung Galaxy mini (turn it on etc), you attach the cover back: Align the casing with the body, ensure the camera hole is perfectly aligned with 3 Megapixel rear camera (able to create QVGA@15fps video recording with geo-tag but no LED flash nor front facing camera), then press the cover-sides down until it clicks and locks with the body of the phone. 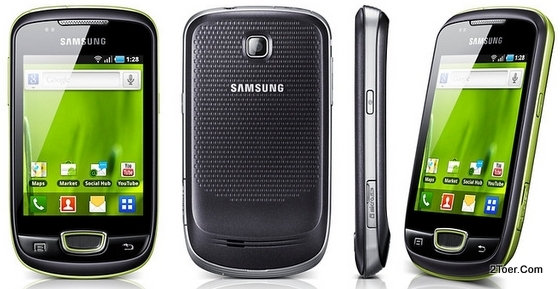 Galaxy mini S5570 uses standard SIM card / USIM. And here the steps you could do on inserting the SIM card: Facing downwards the SIM Card gold-contacts, make the cut-corner of the SIM in outside position, then Slide the the slot of the SIM until it placed. Sometime you need to push it to make the SIM perfectly installed to its slot. After you have inserted the SIM card, you can continue to the next step: Assemble the battery. The battery uses Li-ion type with 1200mAh capacity. You'll see on one side of the battery SAMSUNG logo painted in there. Make sure this logo is facing up. Then align the connector of the compartment with the metal-connector of the battery, slide and press the battery to the compartment. Whenever is place well, you've done. Close the casing back after you finished on install the SIM and battery. The memory card slot on Galaxy mini locates on the left side of the phone's body (from rear facing view, pictured). There is a kind of cover in the sides of the phone with tiny gap you can see. Insert your fingernail into this gap, then flick it to detach the cover. There you can see that the slot is ready. With gold-contacts of the microSD facing downwards (clearly pictured), insert and push the memory card to the slot until it reach the end of the slot. Whenever you release the push and the card didn't eject, that means you've done right and the card successfully locked to the slot. To Eject the Memory card, you just need to do a little trick. Push the microSD card against the slot, release it. That'll make the card pop out and eject. Then you can easily draw the memory card out for its slot. Finally, Close the slot's cover back. In case you forgot your password of your google account or you can't access your smartphone because of this (such as forgot pattern lock or PIN), this factory reset that we gonna give you the guidance will not suited for you. Go to samsung service center to ask for help. That's how you can do Hard Reset. Usually this action is applied due to you phone too often on getting error -- freezes, hangs, stop responding the touchscreen, etc -- and you rebooting or force (by press and hold power button for 10-11 seconds) to restart the Galaxy mini, the problem still appears.